Curro & Poncho, LAMB Arts and Gallery Nosco are proud to present Hijos de la Chingada, a group exhibition investigating the contemporary cultural and artistic Mexican identity through the work of three contemporary Mexican artists: Alejandro Almanza Pereda (b. 1977), Javier M. Rodriguez (b. 1980) and Francisco Ugarte (b. 1973). The exhibition explores the mythical theme of la chingada, the Mexican cultural emblem best described by the Nobel Prize for Literature, Octavio Paz (1918-1998). Famous for his Labyrinth of Solitude (1950) and especially for his insights into the nihilist and instinctive Mexican personality, Paz elucidates on the metaphorical masks of solitude behind which Mexican culture has hidden itself over the years. According to Paz, la chingada is the mythical Mexican mother who has suffered the pains of delivery. At the same time la chingada is a very dynamic term, which has been subject of numerous adaptations during the different eras of Mexican history. Currently, the term has assumed derogatory and negative connotations, by identifying los hijos de la chingada as the good-for-nothing sons of Mexican society. As three hijos de la chingada, the artists of this exhibition try to build bridges with their native mother, discussing with and through her the contemporary meaning of being a Mexican artist today. The experience of solitude or traumatic separations – as analysed by Octavio Paz – whether actual or imagined, can lead to a variety of particular and unexpected outcomes. The concrete features of memory or the strong architectural aspects of the artworks in this exhibition, connote a particular method of questioning the way the world is understood and perceived through culturally specific paradigms. Alejandro Almanza Pereda, with his haphazard works on paper in the form of two-dimensional assemblages permeated by a sense of general precariousness, strips objects and materials away from their original meanings, along the same lines of la chingada, that has been declined from a mythical figure to the quintessential Mexican insult. Almanza Pereda destroys once for all the paradigm of sacralisation of the art object, proposing a new terrestrial and cultural realm for tradition. Multi-disciplinary artist Javier M. Rodriguez’s practice further represents an experimental encounter to question the relationship between antinomies and to look for our own personal resolution to the harmonic conflict within a culture and its historical representation. Rodriguez constructs liminal and blurred spaces with no apparent time, setting the ground for a dialectical and dialogical relationship around the notions of limit and encounter. In his window installation, specifically created for this exhibition, Rodriguez conveys to his cinematic narratives a concrete sculptural dimension, blurring the meaning of time and space, effectively creating a new notion of ‘cinema-expanded time’. The participation of Javier M. Rodriguez in this project has been supported by the Secretary of Culture of The State of Jalisco, Mexico. Francisco Ugarte, the third hijo de la chingada,develops his research towards an architectural and geometrical environment, concrete yet not easier to access. With his visual projections, Ugarte tries to align the natural world with the technological instrument that got his way into the Mexican industry as well as in the whole world. The way countries and populations assimilate and receive new potential means is indicatory of a wider perception of the otherness and Ugarte exploits such means to recreate sublime parallels with his mother earth. 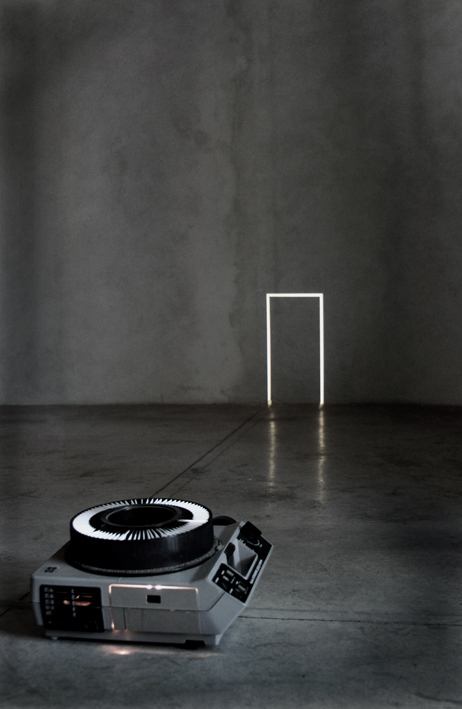 Montañas de Luz (2012), a slide projector that directs a yellow light onto the wall, below which a model of a transparent mountain is illuminated, with its minimalist structuralism, evokes far-away landscapes, far both in space and in time. Hijos de la Chingada is to be viewed and approached as an on-going process rather than as a final result, permeated by a syncretic atmosphere. Its syncretism manifests itself as a quest for translation: the translation of a cultural identity through the means of art with the aim of reversing established paradigms and revealing contemporary ways of contemplating and perceiving the essence of things.